China used to dominate global bitcoin trading, but not anymore. After a series of interventions by the Chinese central bank and self-imposed restrictions by Chinese exchange operators, the share of the global bitcoin trade denominated in yuan has plummeted from over 95% to about 20%. The reason yuan volumes have dropped off a cliff is that the major exchanges ended ended the practice of allowing customers to place trades for free. Zero-fee trading has long been viewed as the culprit for China’s apparent dominance of the bitcoin markets. Chinese exchanges typically let customers place trades for free, but charged for withdrawals. Critics have said this allowed them to project the appearance of robust volumes. But Chinese regulators wanted more “real volumes” reflected on exchange order books, the chief executive of one major exchange, BTCC, told trade publication CoinDesk, so the platforms started charging. The Chinese model was in contrast to platforms in the United States and elsewhere, which charge a fee for every trade. The three biggest Chinese exchanges ended free trading around Jan. 22, and an almost immediate drop in yuan trading volume followed. 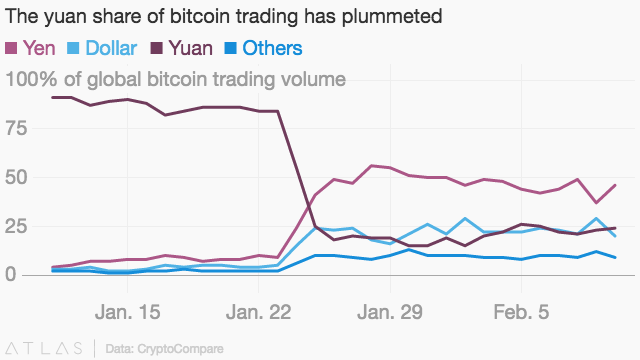 Within the week the yuan’s share of global bitcoin trading was about on par with the dollar. As the yuan volumes plunged, a new currency rose to take its place. Unexpectedly, it was the Japanese yen, which has rarely featured strongly in the bitcoin markets. At first glance, there appears to be a rebalancing of global bitcoin trading volumes, spread among the dollar, yen, and yuan. But look closer and you’ll find the problem: Japan-based exchanges like Quoine and BitFlyer, which account for over 30% of the last month’s yen volumes, had zero-fee trading in place. In other words, it looks like Japanese platforms and their customers are now engaged in the same volume inflation their Chinese counterparts used to partake in. For now, this doesn’t seem to have impacted the bitcoin price too negatively. It fell about 10% on news that Chinese exchanges were temporarily halting bitcoin withdrawals—another self-imposed measure—while they improved money laundering controls. It has since recovered slightly, and is still buoyant at around $970, which is still more than double its price 12 months ago. Bitcoin traders may have hoped that the end of zero-fee trading in China would produce a clearer picture of the nascent cryptocurrency markets; instead, they now have a new source of distortion to filter away.